An Edmonds, Wash.-based fishing group has asked authorities in Washington, Oregon and Idaho to take emergency action to close steelhead fishing in the lower Columbia and Snake rivers for the rest of the 2018 spawning season due to low returns. The Conservation Angler sent letters to the state wildlife commissions and fish and wildlife departments on March 1, noting the forecasts for low numbers of B-run wild steelhead returning this year. B-run steelhead are larger, return later and mostly return to the Clearwater River, a tributary of the Snake River. "We believe there's so few fish, it's a complete risk to those wild fish that do make it to their spawning rivers, even if people catch and release them," Conservation Angler's executive director David Moskowitz told NW Fishletter. He said while forecasts have improved recently, there are too few steelhead to risk losing any. As a catch-and-release fisherman, Moskovitz said he knows that regardless of how careful an angler is, some fish that are caught and released will die or will stop migrating upstream. "It reduces spawning success," he said. 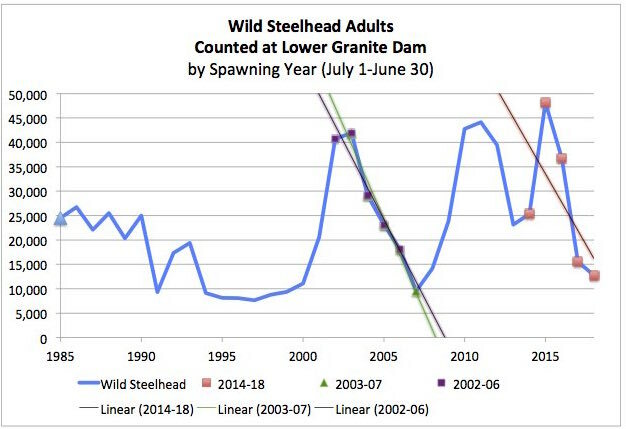 Only 750 steelhead were forecast to make it over Bonneville Dam, and by the first week in March, only 362 had passed the Lower Granite Dam. Moskowitz said Washington state officials responded that they will attempt to coordinate the season with other states, but Idaho appears unwilling, and he's had no response from Oregon.